This was a fun project to design. I needed to add a series of pendants for a gallery show last month and found myself drawn to the simplicity of monochromatic color palettes, letting the textures and shapes of the beads shine though. I had fun mixing metals using copper, gunmetal and steel. The copper became an accent color and added warmth to the darker metals. These are quick and easy. I used a pre-made chain to finish the pendants. I simply cut a chain in half and attached it to the end of my design. 1. With the steel wire create a loop through the pendant and wrap the wire twice, from a smaller loop and continue wrapping the wire under the small loop to create the bail. 2. String the glass leave on the headpin and create a simple loop. 3. Attach the pendant, glass leaf and large copper jump ring to the Arte Metal jump ring. 4. String one glass bead on an eyepin and create a simple loop. Repeat five more times creating six beaded links. 5. Attach three beaded links together with a chain links. Attach the links to the large copper jump ring with a chain link. Attach a chain link to the top bead. Cut the 18" chain in half and attach one side to the top of the beaded links with a small copper jump ring. Repeat on the other side. Pendant: Humblebeads. 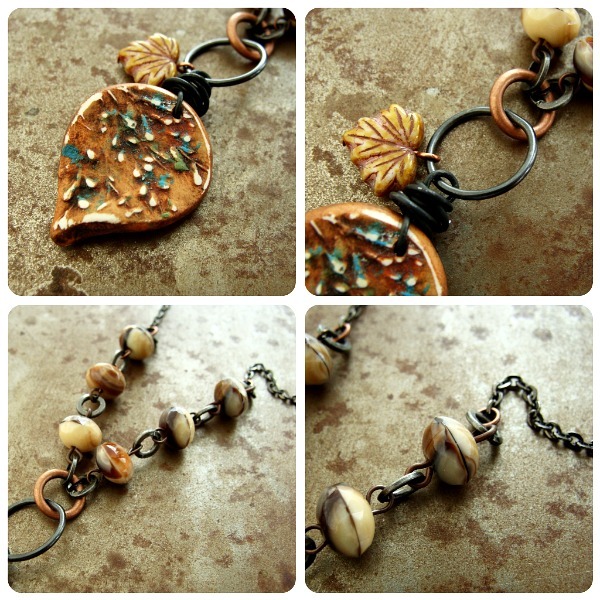 Czech leaves: Dream Girl Beads. Glass beads: various sources, check out Beads by C. Art Metal jump ring, chain and findings: Hobby Lobby. Copper jump rings: Rings & Things. Special bonus: As a year end gift, I'm offering 20% off my Etsy shop now through Monday. Use discount NewYear when you check out. Your projects are always so very pretty and well put together! I love these. I also love monochromatic colour palettes; there's something very satisfying about them. 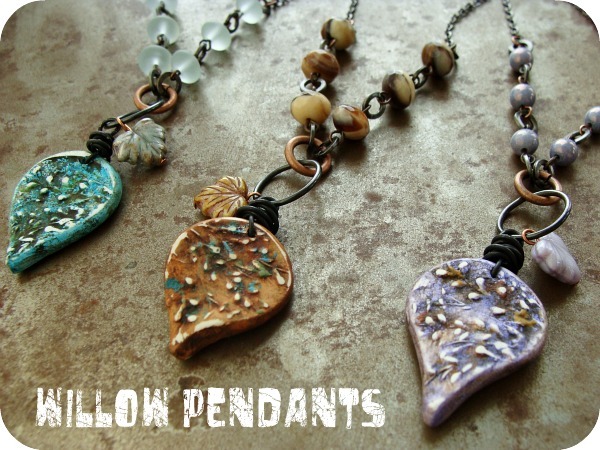 These are lovely and a great jumping off point for other types of pendants. Thanks so much for sharing, always love your ideas!